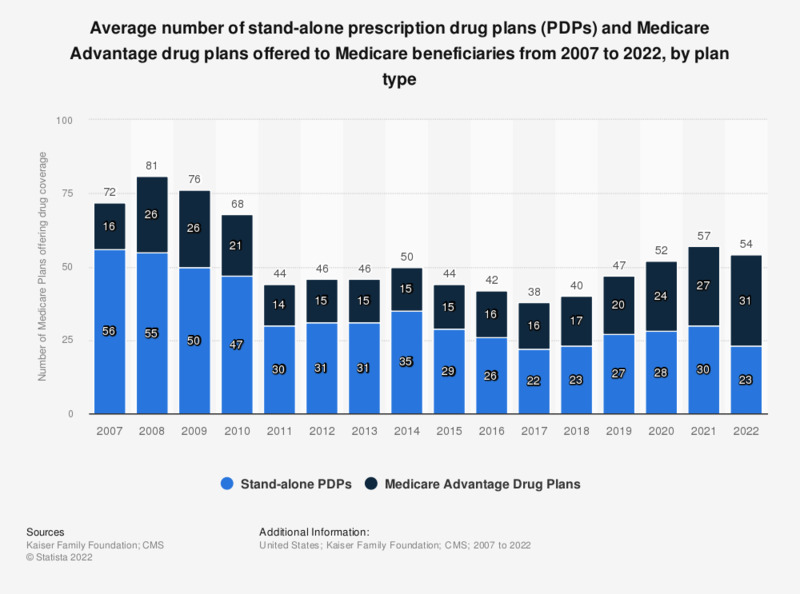 This statistic depicts the number of stand-alone drug plans (PDPs) offered to the average Medicare beneficiary from 2007 to 2019, by plan type. According to the data, the number of Medicare Advantage drug plans offered have increased from 16 to 21 plans from 2007 to 2019. PDP is prescription drug plan. MA-PD is Medicare Advantage drug plan. Plan counts are beneficiary weighted. Number of PDPs is reported at the region level; number of MA-PD plans is reported at the county level and excludes Special Needs plans and MA plans that do not offer the Part D benefit.